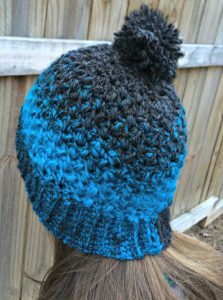 The Beth Hat - Free Crochet Pattern - love. life. yarn. This year I am working on a series of hats for my sons’ teachers. My two older boys go to a Montessori school and between them there are 6 teachers – then you add in my youngest’s teacher at daycare and that makes 7 projects I wanted to get done by December 21st. So far I have made three hats from my two skeins of Lion Brand Scarfie yarn and still have a lot more yarn left! The first two hats I’ve made are slouchy hats and this one is a regular beanie. The style of hat I’m making depends upon the wearer: two of the teachers are younger and like slouch hats, but the others prefer a more traditional style. I used this modified bean stitch in the Simple TexturedCuff pattern and liked it so much I wanted to create a hat with it. I started with the ribbing, working until itwas 21″ long, then I decided not to swatch and just work as many sc as I felt like. Ha – that was a mistake! It ended up too small and I didn’t really pay attention until I was about 10 rows in. So I had to rip it out. I measured first, though, and figured out I was 14 sts less than I needed to be. So I went back until I was at the ribbing and began again. This time it worked out really well! This hat is warm and comfortable and is one of my favorite hats that I’ve made so far. I am really enjoying this Scarfie yarn – the color changes, the fiber content, and the amazing yardage you get out of one skein! I am easily making three hats out of each skein – that’s a great deal for the price of this yarn! I knew when I saw this yarn that I had to make this year’s teachers gifts with it. I always love Lion Brand yarns. Try out Scarfie – you’ll be glad you did! Row 1: Sc in 2nd ch from hook and each ch; turn – 8 sts. Repeat row 2 until piece measures 20″ from beginning. Join with slip st to first row, making a circle. Be careful not to twist ribbing. Round 2: Ch 2, mbs in first mbs, *ch 1, mbs in next mbs; repeat from * to end; join to first mbs with slip st; turn. Rounds 3-12: Repeat round 2. Round 13: Ch 2, mbs in first mbs, (ch 1, mbs in next mbs) 6 times, *ch 1, mbs2tog, (ch 1, mbs in next mbs) 7 times, repeat from * two times, mbs2tog, ch 1, join to first mbs with slip st; turn – 24 mbs. Round 14: Ch 2, mbs in first mbs, ch 1, mbs in next mbs, *ch 1, mbs2tog, (ch 1, mbs in next mbs) 2 times; repeat from * four times, ch1, mbs2tog, ch 1, join to first mbs with slip st; turn – 18 mbs. Round 15: Ch 2, mbs in first mbs, ch 1, mbs2tog, *ch 1, mbs in next mbs, ch 1, mbs2tog; repeat from * to end, ch 1, join to first mbs with slip st; turn – 12 mbs. Round 16: Ch 2, *mbs2tog, ch 1; repeat from *, join to first mbs with slip st – 6 mbs.. Round 17: Repeat round 16 – 3 mbs. Fasten off, leaving a long tail. Draw tail through remaining sts and pull tightly to close. Create pom-pom and attach to top. 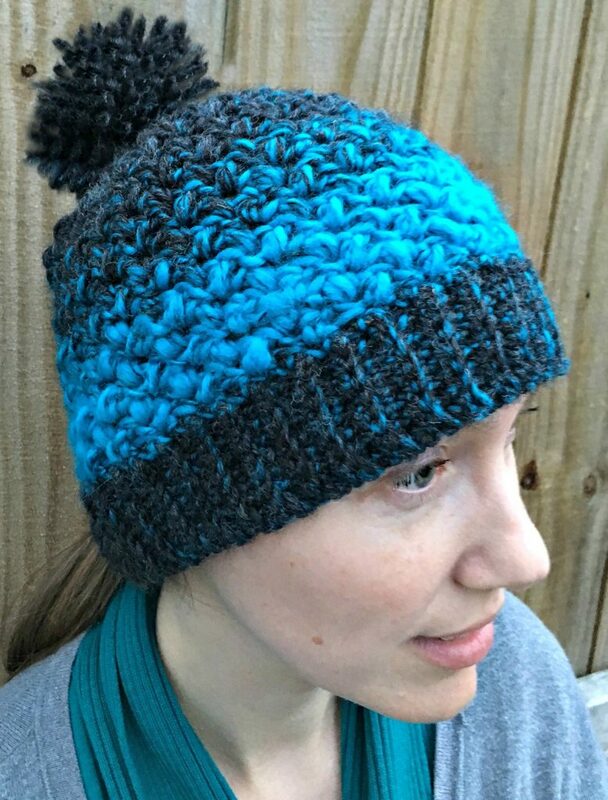 If you like this pattern, check out the Quick and Easy Messy Bun Hat, which I created using this pattern but left room for a bun or ponytail to peek through. I really enjoyed the texture of the stitches paired with the colors of this yarn. 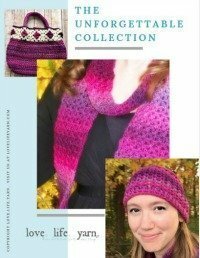 I hope you enjoy these free patterns. Happy crocheting!